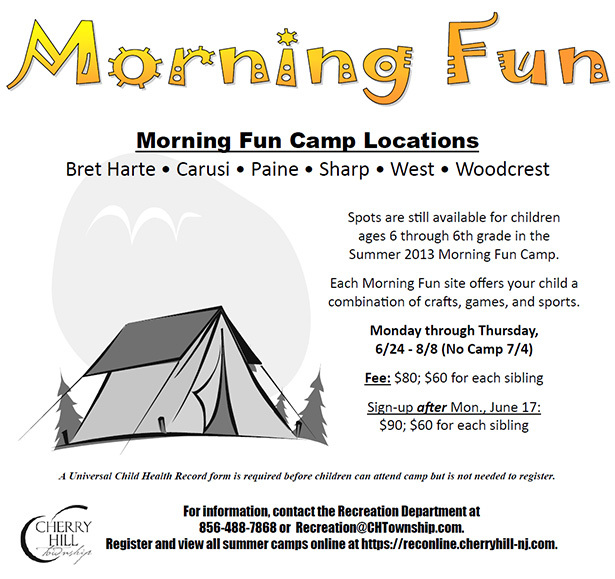 Morning Fun Camp; now registering! Download a registration packet here. Spots are still available for children ages 6 through 6th grade in the Summer 2013 Morning Fun Camp. Each Morning Fun site ofers your child a combination of crafts, games and sports. A Universal Child Health Record form is required before children can attend camp but is not needed to register. Register and view all summer camps online at https://reconline.cherryhill-nj.com. Morning Fun Camp June 24 - August 8; now registering. Children ages 6 through entering grade 6. Call 856-488-7868 for information.